An Introduction to Probability and Statistical Inference, Second Edition, guides you through probability models and statistical methods and helps you to think critically about various concepts. Written by award-winning author George Roussas, this book introduces readers with no prior knowledge in probability or statistics to a thinking process to help them obtain the best solution to a posed question or situation. It provides a plethora of examples for each topic discussed, giving the reader more experience in applying statistical methods to different situations. 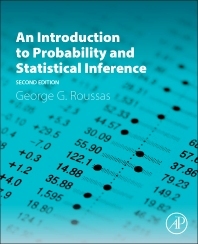 This text contains an enhanced number of exercises and graphical illustrations where appropriate to motivate the reader and demonstrate the applicability of probability and statistical inference in a great variety of human activities. Reorganized material is included in the statistical portion of the book to ensure continuity and enhance understanding. Each section includes relevant proofs where appropriate, followed by exercises with useful clues to their solutions. Furthermore, there are brief answers to even-numbered exercises at the back of the book and detailed solutions to all exercises are available to instructors in an Answers Manual. This text will appeal to advanced undergraduate and graduate students, as well as researchers and practitioners in engineering, business, social sciences or agriculture. George G. Roussas earned a B.S. in Mathematics with honors from the University of Athens, Greece, and a Ph.D. in Statistics from the University of California, Berkeley. As of July 2014, he is a Distinguished Professor Emeritus of Statistics at the University of California, Davis. Roussas is the author of five books, the author or co-author of five special volumes, and the author or co-author of dozens of research articles published in leading journals and special volumes. He is a Fellow of the following professional societies: The American Statistical Association (ASA), the Institute of Mathematical Statistics (IMS), The Royal Statistical Society (RSS), the American Association for the Advancement of Science (AAAS), and an Elected Member of the International Statistical Institute (ISI); also, he is a Corresponding Member of the Academy of Athens. Roussas was an associate editor of four journals since their inception, and is now a member of the Editorial Board of the journal Statistical Inference for Stochastic Processes. Throughout his career, Roussas served as Dean, Vice President for Academic Affairs, and Chancellor at two universities; also, he served as an Associate Dean at UC-Davis, helping to transform that institution's statistical unit into one of national and international renown. Roussas has been honored with a Festschrift, and he has given featured interviews for the Statistical Science and the Statistical Periscope. He has contributed an obituary to the IMS Bulletin for Professor-Academician David Blackwell of UC-Berkeley, and has been the coordinating editor of an extensive article of contributions for Professor Blackwell, which was published in the Notices of the American Mathematical Society and the Celebratio Mathematica.